Family portraits / Andrea Keller. Paper sandals : [eScore] / Andrea Keller. Paper sandals / Andrea Keller. A notated piece for solo piano. Can be performed minus preparations. 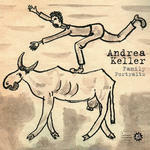 Written as part of a series of pieces dedicated to Keller's family, recorded on 'Family Portraits'. Commission note: Composed as part of Keller's two-year Australia Council Fellowship. 10 Feb 12: Melbourne Recital Centre Salon. Featuring Andrea Keller.